JD OXIDIZER, BIGGER CHEESE, BUMPER CARS BOB AND PAT C SLY COOPER SEEK TO REMAIN UNDEFEATED! West Palm Beach, Fl. - After beginning with a field of 64 Greyhounds and 16-qualifying events, an amazing four canine athletes will enter Wednesday afternoon’s third-round of qualifying for Palm Beach Kennel Club’s $20,000 Bob Balfe Puppy Stakes with a perfect two-for-two record. In Race 12, two of the four unbeaten qualifiers will meet head on as the fantastic late-speed artist #2 JD Oxidizer (KC And All – JD Happy Tears, Brindle Kennel) takes on the strong first-turn rusher #3 Bigger Cheese (Barcelona Boss – Kiowa Jill Boom, Rader Racing Kennel). Both entries are in good spots to enter the semifinals undefeated, but there may be some roadblocks in place. #1 PJ Distorted (KC And All – Kelsos Jenna, Agganis Kennel) is in his favorite post to use his early speed and most likely will be the pacesetter while #8 Palm City Tyson (Atascocita Gray – Skate Parchy, B & B Racing Kennel) is sitting pretty on the outside and will also be amongst the front runners. Race 14 features the undefeated #6 Bumper Cars Bob (Barcelona Boss – Miss Prissy, Rader Racing). Bob may encounter some bumper cars of a different nature, facing off against some of the best early speed Puppy Stakes qualifiers, including the ever-improving #5 Barts Beast Mode (Deerfield Mover* - GV Tilda, James Douglas Kennel). The final event of Wednesday afternoon in Race 15 will highlight our final undefeated puppy stakes qualifier, the remarkable #3 Pat C Sly Cooper (Pat C Clement – Pat C Deception, Koppe, Staats & Collins Kennel). Cooper will be going for his fifth-consecutive overall win but will face challenges from the well-posted round two victors #1 Racy Peg (Bella Infrared – Princess Bula, B & B Racing) and #8 Crown Connie (Crown And Crest – Schoolyard, Lester Raines Kennel) and perhaps most threatening #7 Britney Eureton (Barcelona Boss – Miss Prissy, Rader Racing). A third-round qualifier will also be contested in Race 10. Following Wednesday afternoon’s third round, the field will be halved to sixteen competitors, who will then advance to the fourth and final round Sunday afternoon, April 21, all vying for a slot in the final eight. 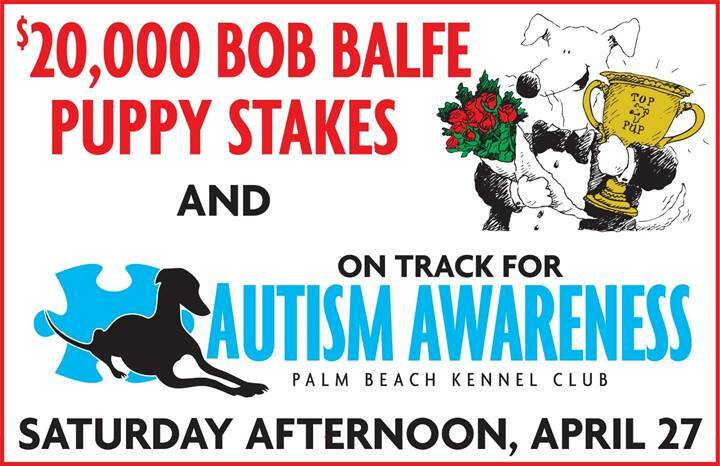 The 53rd running of the $20,000 Bob Balfe Puppy Stakes will be contested Saturday afternoon, April 27. The Puppy Stakes is named in honor of former Palm Beach Post Time sports columnist and great friend to Greyhound racing, Bob Balfe.